Suitable for family or two couples with single floor level throughout. Aft access for easy mooring. Warm air heating. 12 Volt system. 1 Double and 2 Single or 2 Double. 2 Toilets and 2 Showers. Week start days: Monday or Friday. Short break start days: Monday or Friday. 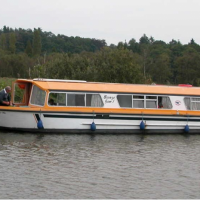 Please note that none of the boats operated by Richardson’s will provide electrical power to enable a nebuliser or any other electrical appliance needed for medical reasons to be used on board.